Most refrigeration compressors must have a level of oil in the crankcase of the compressor to provide lubrication for the metal parts of the compressor. All compressors "pump oil". This means that in the normal operation of compressing gas, a small amount of oil is pumped out with the compressed gas. On air compressors for air tools, oil must be periodically added to replace the oil lost. Most refrigeration systems must run automatically with no internal maintenance so any oil pumped out must return to the compressor through the normal operation of the system. For this to happen, the oil must mix with the refrigerant and be compatible with the refrigerant. Compatible means there should be no chemical reaction between the refrigerant and the oil. For many years the oil used in refrigeration systems was a mineral oil somewhat similar to automotive lubrication. Automotive oils are not suitable for use in refrigeration systems. Oil in refrigeration systems is not changed regularly. Because refrigeration systems are a closed system, there are no contaminants that can damage parts of the system. The only reason to change refrigeration oil is if a burnout or mechanical damage has occurred. Refrigerants such as R-22, R-502 and R-12 Are solvents that will mix with mineral oils. This is one of the reasons they were so widely used. It is somewhat similar to using gasoline as a solvent to remove oil or grease. R-12 and R-502 are CFCs and sales were restricted to lower levels each year after 1992 and phased out in 1996. 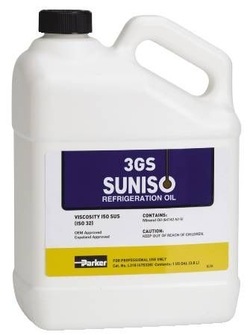 So units made after 1992 used other oils to be compatible with replacement refrigerants. Specifically R-134A is a replacement for R-12. However, if I replace R-12 with R-134A, the mineral oil reacts with the R-134A producing a sludge that will damage the internal parts of the compressor and block the expansion valve. 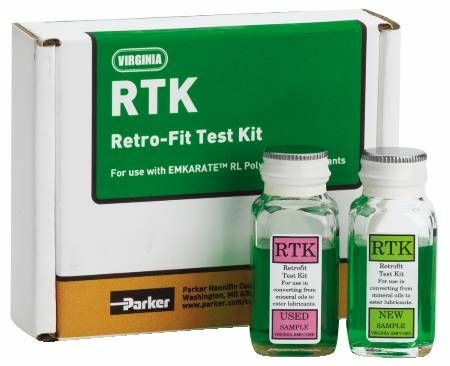 This is an example of an oil test kit. If You are replacing mineral oil with POE or PAG oil (see below) you must have less than 5% of the mineral oil left in the system to avoid sludge. Drain the mineral oil out, replace it with the new oil, charge the system with refrigerant and run the system for at least 1 hour. Remove a sample of oil and test with the kit. If there is still too high a concentration of mineral oil, replace oil until it reads ok. This a simple explanation of how the test is done. For more complete instructions, check manufacturer instructions. In many cases, when using a used hermetic compressor, the procedure for replacing the oil exceeds the value of the compressor and a more sensible option is to replace the compressor with one with the proper oil. 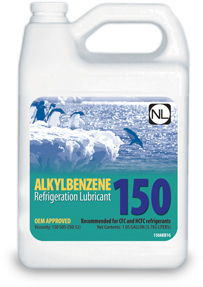 This oil is used in newer systems that use HFC refrigerants (such as R-410A). It is compatible with all CFC or HCFC refrigerants also. This oil has one problem. It is highly hygroscopic. This means when exposed to moisture, it absorbs it aggressively. Moisture is the enemy of refrigeration systems. It will cause corrosion problems and freeze up of the expansion valve. If the system is open to the atmosphere for more than 15 minutes, contamination will occur. Normally, if moisture is present, it can be removed with deep evacuation. With POE and PAG oils, evacuation will not remove the moisture. The only way to remove the moisture is through the use of oversize filter-driers in the system. Extra precautions to avoid exposure to moisture must be used with this oil. 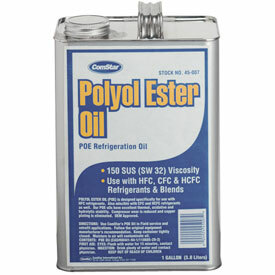 This was the first replacement oil for mineral oils to be used with HFCs. It was primarily used in automotive air conditioning. It has some reaction with copper so it not normally used with residential and commercial air conditioning. It is even more hygroscopic than POE. Click here for a demonstration of the ability of PAG oil to absorb moisture.